CEAC staff member Kyla Mackenzie interviews Anna Korver in the lead-up to her Summer School class in January 2011. Click HERE for a full description of Anna’s class & enrolment details. KM: What is direct carving? AK: The way I interoperate and use the term ‘direct carving’ refers to carving straight onto the material I’m working with, deciding on the form and shape as I go and allowing the stone or wood to dictate some of the work through natural flaws, shape and grain. This differs from carving from a Marquette or drawing or pre-planned design. I don’t often work using direct carving now days however. It is more common for beginners to use this method as once you have developed your own style as an artist you tend to chose materials to fit your work not the other way around. KM: Describe, if you can, the thrill you get from direct carving and the challenges it presents? AK: Direct carving can be a ‘thrilling’ way to carve. It is quite unpredictable and relies a lot on the sculptor finding some instinctual inspiration form the material. It is more of a dialogue, or a compromise with the material. It is an especially good way to carve when using wood or New Zealand stone due to its size shape and fracturing that is common with stone that has been blasted out of the quarry. Wood in itself is quite variable and even when you have a plan it can change if the wood has a certain shape or unseen flaws. It can be challenging at times not being sure of the end point, though sometimes this is also a good thing as it can reveal things you would otherwise have missed or not have contemplated. KM: What was the last ‘eureka’ moment you had working with a piece of material? KM: Who are some of the carvers/artists you most admire? AK: I come from a very creative family so I think it was inevitable, however the one person who most inspired me to become an artist was Donna Demente. I grew up in Nelson and was about eight when I saw her wearable art entry at the Suter art gallery. It was at that point that I decided I wanted to become an artist. I visited her at her studio when I was at high school doing my bursary art folio and have continued to be inspired by her. I also admire many New Zealand artists; Paul Dibble, Bill Hammond, Julia Morrison. And obviously there are a number of historical artists and carvers who hold the admiration, Rodin, Louise Bourgeois, Henry Moore, Lalique and many more. I also have great admiration for so many other artists and carvers who I have met over the years that I couldn’t begin to name them all. I have had the great privilege to work along side some of the best carvers in the world both in New Zealand and overseas. KM: Some of your works are virtually abstract. Is it easier to work with simple concepts and designs with direct carving? AK: The hardest things to carve are: perfect circles, straight lines, and simple forms. Some sculptors spend their whole careers trying to find simplicity. KM: Your works are said to be autobiographical and related to female identity. Do you feel a keen sense of your own body when coaxing curves from your materials? AK: Yes I do. I am accepting that more and more. When I started it was a subconscious thing and as I have continued I have had to own the concept that the forms are self representative. It is natural to carve what you know. I have friends who carve faces and even in the abstract form you can recognize them or their partners faces, which are obviously most familiar to them. KM: A lot of your work seems to celebrate the female form but is there an element of ambivalence behind this preoccupation? AK: At times I think there is. Though I think when you are an artist full time you can be ambivalent about some works as it is impossible to be 100% connected to every single piece you make. Sometimes the figure can become a mere shape or form and like wise reflects my current mood. I was once asked by a professor from a university feminist department if I was finished with the figure, if I had found in it all that I could say about it, but obviously I haven’t yet as it is my most natural form to speak from and about myself. KM: There is a ‘gothic’ or romantic undercurrent in Cantabrian art. Your ‘floating’ ‘dresses’, and your installation piece ‘Wedding Cages’ from a few years ago are suggestively historical and ethereal with their slender waists and full length graceful gowns. Does your hometown of Canterbury have any bearing on this? AK: My home town is actually Nelson, and to be honest I connect very little of my art practice with Christchurch. So I would have to say no…even from a child I was always drawn to certain imagery, motifs and eras. This is probably why I have such a connection to the art of Donna Demente, Julia Morrison and others. I love Victorian style dresses, Art Nouveau, gothic, gypsy, greek, renaissance style of art, the sort of elaborate, decorative overly feminine preoccupation with beautiful adornments. KM: What historical or contemporary aspect of women in society interests you? KM: What are some ‘masculine’ elements in your works? AK: The masculine elements are the harsh architectural lines that I am developing. I see these as masculine as there is a saying ‘there are no straight lines in nature’ which is inherently true when you see a straight line; it stands out as a man made form. 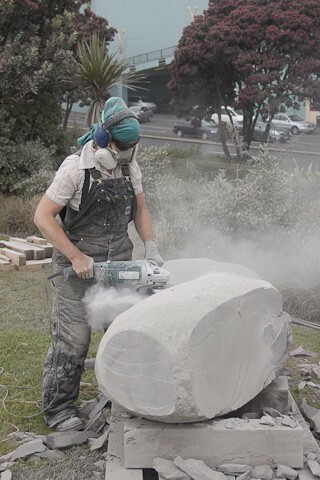 KM: You will be taking a stone carving workshop from 18 – 20 January at Corban Estate Art Centre in Henderson. The students will be using Oamaru stone. What will they find most rewarding about working with this stone – what are its most appealing qualities? AK: Carving is two things, the technical side, how to use the tools and how to remove the stone. The other side is much more difficult, the conceptual side, what to carve and which bits of stone to remove to find this form. Oamaru stone is perfect for beginners as it is very easy to learn how to use the tools, it is a very predictable stone, there is no grain to work with, it doesn’t have fractures to work around. This quickly eliminates the fear about the difficulty of the actual carving aspect and leaves the students to focus on creating their form. Comparatively it is a quick stone to work and they will achieve a lot quicker than they think which helps to inspire a beginner to carving. The color and the contrasts you can get with lines and shadows is very effective where as a more complex patterned stone can be confusing to work with when you’re just starting. KM: What are some of the challenges of working with this particular material? AK: This medium isn’t overly challenging. It isn’t a very fine grain stone though so you are limited as to how detailed your design can be, though you can still push it quite far it you’re gentle with it. It can be fragile depending on the form you’re carving so it take a bit of trial and error to get to know the stone. As with all carvers at any level, being prepared to change and adapt if the stone breaks is a common thing to deal with. KM: How would you describe your approach to teaching sculpture? AK: I am quite a hands on teacher. I like to give a lot of demonstrations so students can get a visual of what I’m trying to explain. I tend to work one on one with each student as they need assistance as I like them to bring their own designs and carve something they can connect to. This means that they may be at different stages or require different skills to make their work, though I explain each new technique to all the group. I also like to get a class dynamic going because students also learn a lot from those working around them. All in all I try to provide a fun, encouraging and supportive environment for students. KM: There are some wonderful things happening in sculpture in New Zealand at the moment. What are your thoughts on ‘our’ sculpture compared with that internationally? AK: I think that New Zealand sculpture has progressed enormously in the last few decades. New Zealand is developing an art culture with the galleries, critics and collectors that has begun to support and encourage this growth which is crucial. I think there are many different areas of sculpture which are more or less comparable to the international scene but I can speak first hand from working with international hard stone carvers and I would say that some New Zealand hard stone carvers are definitely at the same level as the international sculptors. Where we lack is money, access to large stone and being so remote over here. Many of the international symposiums expect works up to 20m tall and even though many people have more than enough talent it is hard to be selected when you can’t prove you can work that big. KM: Are you excited about the future of sculpture? Don’t miss out on this free event!! 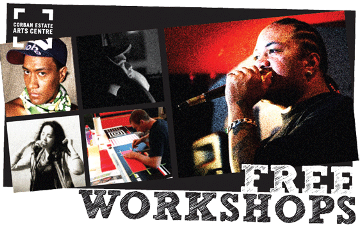 Westfield vouchers to be won IF you get involved and show some your stuff including freestyle rap and dance. Come and get amongst it!